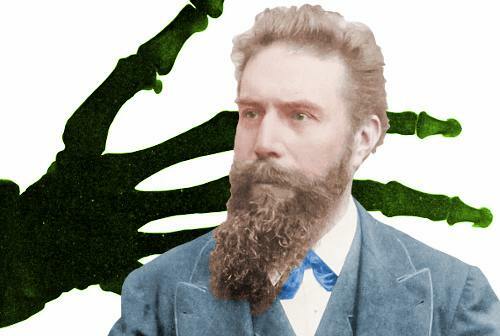 The German physicist, Wilhelm Conrad Röntgen was the first person to systematically produce and detect electromagnetic radiation in a wavelength range today known as x-rays or Röntgen rays. His discovery of x-rays was a great revolution in the fields of physics and medicine and electrified the general public. It also earned him the Rumford Medal of the Royal Society of London in 1896 and the first Nobel Prize in Physics in 1901. He is also known for his discoveries in mechanics, heat, and electricity. Röntgen was born on March 27, 1845, at Lennep in the Lower Rhine Province of Germany. He was the only child of a merchant and cloth manufacturer. Röntgen was brought up in Netherlands after he and his family moved to Apeldoorn in 1848. Here he first received his early education at the Institute of Martinus Herman van Doorn, a boarding school and in 1861 attended the Utrecht Technical School. Unfortunately in 1863 he was expelled unfairly from his school after being accused of a prank another student had committed. Even though Röntgen did not seem to be especially gifted in his schoolwork, he was good at building mechanical objects, a talent that enabled him to build many of his own experimental devices in his later life. He then entered the University of Utrecht in 1865 to study physics without having the necessary credentials required for a regular student. In 1869, he earned a Ph.D. in mechanical engineering from the University of Zurich. Here he attended lectures by the noted physicist Rudolf Julius Emmanuel Clausius and also worked in the laboratory of Kundt. As soon as he completed his graduation he was appointed assistant to Kundt and went with him to Würzburg in the same year, and three years later to Strasbourg. In 1874 he was appointed as a lecturer at Strasbourg University and in 1875 served as a professor in the Academy of Agriculture at Hohenheim in Württemberg. In 1876 he returned to Strasbourg as Professor of Physics. Three years later he accepted the invitation to the Chair of Physics in the University of Giessen. In 1888, he obtained the same position at the University of Würzburg, and in 1900 at the University of Munich. Even though he accepted an appointment at Columbia University in New York City but due to the occurrence of World War I, Röntgen changed his plans and remained in Munich for the rest of his career. For decades, he had been studying the effects of electrical charge on the response and appearance of vacuum tubes. The science of electricity was still relatively new, and there remained much to understand. His set-ups used relatively simple components by today’s standards. He conducted a series of experiments in 1895 in which he connected a type of vacuum tube (visualize a light bulb on steroids) called a Hittorf-Crookes tube to an early and very powerful electrostatic charge generator known as a Ruhmkorff coil, similar to what sparks a car motor to start. He was trying to reproduce a fluorescent effect observed with another type of vacuum tube called a Lenard tube. The filament inside produced a stream of electrons which was well-known, called a cathode ray. To his surprise, this produced fluorescence on a screen coated with a compound called barium platinocyanide, several feet away. This suggested to him that a hitherto unknown, and entirely invisible, effect was being produced. We know now that the cathode ray had excited the atoms of the aluminum to produce X-rays, which in turn excited the atoms of the barium (an element which fluoresces readily). He also discovered that when his hand passed between the electrically charged vacuum tube and the barium platinocyanide coated screen, he saw his bones. He reproduced this phenomenon with his wife, causing horror. After secretly confirming his findings, he published an article titled, “On A New Kind Of Rays” (Über eine neue Art von Strahlen) in 1896. This revelation and its nearly immediate application to all sorts of medical imaging earned him an honorary medical degree. He earned the Rumford Medal of the Royal Society of London in 1896 and his Nobel Prize was awarded in 1901. Röntgen died at Munich on February 10, 1923, from carcinoma of the intestine.